Stand out from any crowd with slim business cards! They may be skinny but they'll speak volumes about your company. Their unique and sleek design will set your cards apart from the rest. Compared to standard cards, thinner business cards are easier to store and hand out to your customers or clients. They could especially make for a unique take on fashion or yoga business cards, or other small businesses including creative studios, online businesses, and photographers. 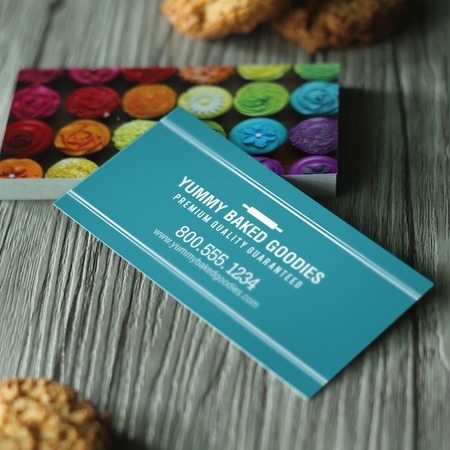 When designing these small business cards, consider the font, text sizes, and color combination that you’ll use. Remember that less is more when making your slim business cards effective and powerful. Vertical business cards are also a popular choice for its 1.75” x 3.5” dimensions. Your cards can be printed on 14 pt., 16 pt., or 17 pt. cardstock with a gloss, matte, uncoated or high gloss coating. Print on the front only or on both sides. Quantities range from 25 to 10,000, and have a printing turnaround of 1-3 business days. Check out the Different Business Card Shapes for Printing for more ideas.